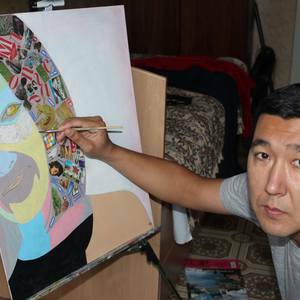 Aibek Nogorbekov (41) grew up in Kyrgyzstan during a period of upheaval brought on by the collapse of the Soviet Union. He knew what it was to live in a society where there were fixed expectations. His development as an artist was slow perhaps because he wanted to express himself in a way which was new and to some it was threating. He worked for some years as a designer of jewellery but this did not fully utilise his talents. He felt driven to take up painting as his life’s work. He is inspired by the patterns of daily life. What the common man overlooks speaks to Aibek. His work has a familiarity to those who would otherwise miss out on enjoying God’s creation in a deeper way. He aims to give joy and peace to those who are drawn to his work.